Recognized as a quality Breeder. Discover 300+ breeds & find australian cattle or blue heeler puppies for sale. 2. The total price ranges greatly depending on the bloodlines. All deposits are nonrefundable. All Final payments are non-refundable. 3. We will contact you when the puppies are born and pictures will be posted to our website when they are old enough. 4. The remainder of the adoption fee is due when the puppies are allocated/selected. 5. At about 7 weeks of age arrangements will be made for you to get you puppy. 6. Just after 6 weeks of age your puppy will be vaccinated and will have been dewormed at 2, 4, and 6 weeks. 7. Puppies come with a, genetic guarantee, 48 hour health guarantee, Vaccination Schedule, and helpful tips printout. 8. Your puppy will be started training with potty training, voice commands, crate training, livestock training and Early Neurological Stimulation "Super Dog Training" Puppies will also start socializing with farm life and family life. 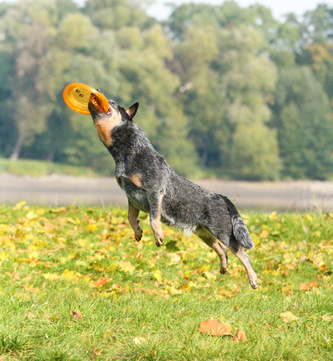 The Australian Cattle Dog is a loyal, brave, hardworking, herding breed. One of the most intelligent breeds, they are not the kind of dog to lay around the living room all day or with only a 15 minute walk. They need much more exercise than that and something to occupy their mind daily or they will become bored, leading to behavior problems. They need action in their life and will do best with a job. This alert dog is excellent in the obedience ring and will excel in agility and herding trials. Can be obedience trained to a very high level. Firm training starting when the dog is a puppy and a lot of daily leadership, along with daily mental and physical exercise will produce a wonderful and happy pet. Protective, they make an excellent guard dog. It is absolutely loyal and obedient to its master. They are sometimes suspicious of people and dogs they don't know. They can be dog aggressive if allowed to be pack leader, for its dominance level is high. Teach your Australian Cattle Dog that you are alpha and you will not tolerate him fighting with other dogs. Well balanced Cattle dogs are good and trustworthy with children. Some will nip at people's heels in an attempt to herd them and an owner needs to tell the dog this is not acceptable behavior. 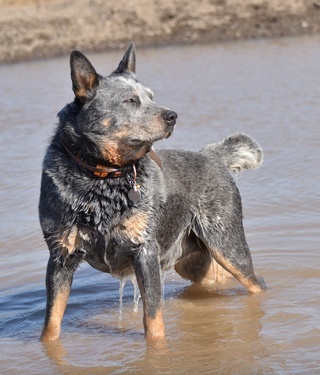 Australian Cattle Dogs are very easy to train. Problems can and WILL arise with meek owners, and or owners who do not provide the proper amount and type of exercise. This breed does best with a job to do. If you do not have time to extensively work with and exercise your dog, or do not fully understand canine instincts and their need to have leadership, this is not the breed for you. ACD have incredible stamina and will enjoy all the activity you can give them. The life Expectancy is About 12-15 years. The AVERAGE Australian Cattle Dog will be 35 to 50 pounds and stand 17 to 20 inches at the withers. Do Cattle Dogs shed much? The typical Australian Cattle Dog does not shed year round but instead "blows it's coat" once or twice per year. During this one or two (or three) week period The ACD sheds out there undercoat first and then guard hair in big clumps.